Volunteers Freda Nicholson, Jane Stevenson and Pat Fisher working for Fresh Start Borders who distribute household goods to deprived youngsters starting a new home. 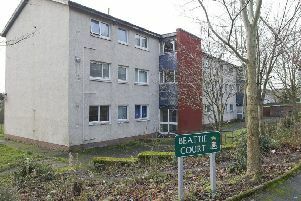 Homeless youngsters who have secured homes will now receive personal supplies after a Selkirk-based charity was awarded a grant of more than £2,000. Selkirk-based Fresh Start Borders was awarded £2,195 from the Co-op Local Community Fund in its first payout since it was launched last September. 1% of what each Co-op member spends on own-brand products goes into the cash pot along with money from the 5p plastic bag levy. The charity was nominated by staff at the High Street shop and will now be able to increase the number of products that go into their starter packs given to those moving into their new homes, often for the first time. Irene McFadzen, chairwoman of the charity which was founded in 2009, said: “This is a great boost for us and will last a few years. The team of 10 volunteers work on a weekly basis to put the packs together which consist of household goods such as cleaning equipment, cutlery and bedding. The items are handed in as donations and the total cost of the starter packs if they were to be bought new would cost up to £200. Irene added: “Many tenancies fail as the tenants have nothing. “Around 80% of the people we help are single. Many are youngsters who are leaving home for the first time due to family break-ups, or leaving foster homes. Now, thanks to that cash windfall, the charity will be able to include toiletries in the starter packs including shower gel, soap and deodorant. Chief membership officer at the Co-op, Rufus Olins, said: “The Co-op has always been community focussed. The original Rochdale Pioneers were motivated by the need to improve the living conditions of those within their local community and they also understood that values were just as important as value. During 2014 and 2015, there were 1,015 people who approached homelessness services at Scottish Borders Council.